Harpist Glenda Allaway is a young musician from North Herefordshire currently living in Greenwich, London. She passed her first Grade 8 music exam at the age of 13 and currently holds Grade 8 certificates in harp, violin and piano and a Diploma in Music Theory (A Mus TCL) from Trinity College London. 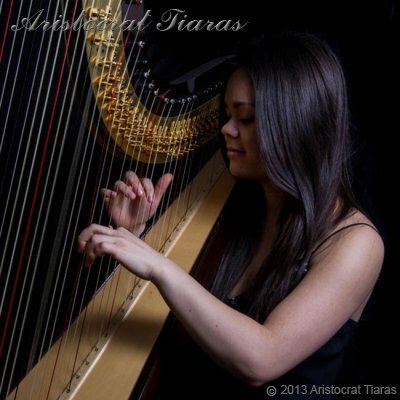 She is currently studying harp under Gabriella Dall'Olio at Trinity Laban Conservatoire of Music and Dance in London where she was Gladys Bratton Scholar for 2012. For the past 8 years, Glenda has performed in a variety of musical situations as a member of an orchestra or band, and as a soloist. She studied 6th Form at Chetham's School, where Glenda played harp with the Chetham's Symphony Orchestra and several Chetham's School ensembles. She is currently principal harpist with the City of Birmingham Symphony Orchestra (CBSO) Youth Orchestra, has twice been selected to participate in the CBSO Youth Academy, and was a member of the Herefordshire Youth Orchestra as both a violinist and harpist. As a young teenager, Glenda played harp solos at the Courtyard Theatre in Hereford, the Wyeside in Builth Wells, has twice been selected to perform solo pieces in final concerts for harp workshops at the Royal Welsh College of Music and Drama in Cardiff and was invited to play in a retirement concert for the West Mercia Police Chief Constable. Since studying in London, she has regularly performed as a solo harpist or as a part of a duet / small ensemble at various locations around the capital. Glenda was presented the "Hereford Young Musician of the Year" award by the committee of the Herefordshire Performing Arts Festival for 2 consecutive years and has been awarded the Leamington Spa Music Festival's "Most Promising Harpist" on two occasions. Glenda has also won prizes in a number of music festivals and eisteddfodau throughout the Midlands and the mid / South Wales area. Glenda now specialises in harp performance and plays harp regularly at weddings, birthday parties, events and functions. If you are looking for a wedding harpist for your wedding or special occassion in Herefordshire, London or the surrounding areas, please get in touch. Please contact us to enquire about Glenda playing at your wedding.